Leaps Ahead classes will provide an introduction to the training tradition of classical ballet, including instruction in physical conditioning, developing the ability to concentrate and lengthen the attention span, developing the visual and aural memory, learning to understand and apply verbal corrections, and learning to work in concert with the other members of the class (spatially, musically, and technically). Students will learn basic classroom protocol, fundamental terminology and the movements and exercises of classical ballet. An important element of this introductory training is the development of the students’ interest and appreciation of the performing arts and their opportunity to explore dance as an expressive and creative outlet. 45-minute instructional periods at Tulsa Ballet’s state of the art facility, taught by TBCDE faculty. Appropriate class uniform for each child, at no cost. Three tickets to attend a Tulsa Ballet Performance and a commemorative t-shirt for each student. The program currently runs in sessions of 3 weeks with students attending two days per week. These sessions are available on a first come first serve basis, and are held September through November. 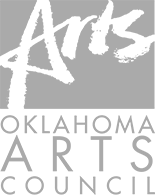 Tulsa Ballet artistic staff evaluates the participating students at the end of each session and offer scholarship opportunities to up to two talented students. Program evaluation is made available to participating educators at the end of each session. A 45 minute instructional period at participating school, taught by TBCDE faculty. Commemorative t-shirt for each child, at no cost. Voucher for up to three free tickets to attend a Tulsa Ballet Performance for each student. Five, 2-week sessions are available to apply for on a first come first served basis. The applications must be fully completed for consideration. The sessions will be held throughout the school year. Classes are held Monday through Friday. The Tulsa Ballet Center for Dance Education staff will conduct program evaluations with input from the faculty members of participating school at the close of each two week session. Participating faculty members will be requested to supply pre- and post- program information through secured internet surveys. The fees for this program are based on a sliding scale. Our new matinee performances of Ma Cong’s Peter & the Wolf are perfect for ballet’s youngest fans. 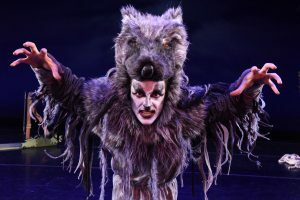 This brand-new ballet experience is created especially for children and young families, and features a cast of characters children know and love, with narration to help them understand the story. This magical performance will come to life on-stage thanks to all-new sets, costumes, and choreography, designed just for Tulsa Ballet. 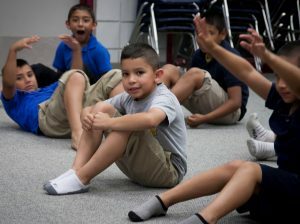 This Brand-New program is being performed for all 5th grade Tulsa Public School students in conjunction with our Any Given Child-Tulsa partnership. Underwriting support for Peter & the Wolf generously provided by the Hardesty Family Foundation and the Stinson Family. Any educator interested in enrolling or needing more information about our outreach programs should contact Colleen Lahti at 918-749-6030 or colleen.lahti@tulsaballet.org.